Proper sanitation is critical to survival and should not be ignored as you prepare for the challenges in our future. While it may be uncomfortable to talk about, the leading cause of illness and death in both natural and man-made disasters is inadequate sanitation, poor hygiene practice, and contaminated and insufficient water supplies. Frequently more people die after a disaster due to poor sanitation, than die from the initial event. We can prevent this! A little bit of advance preparation can make a huge difference. 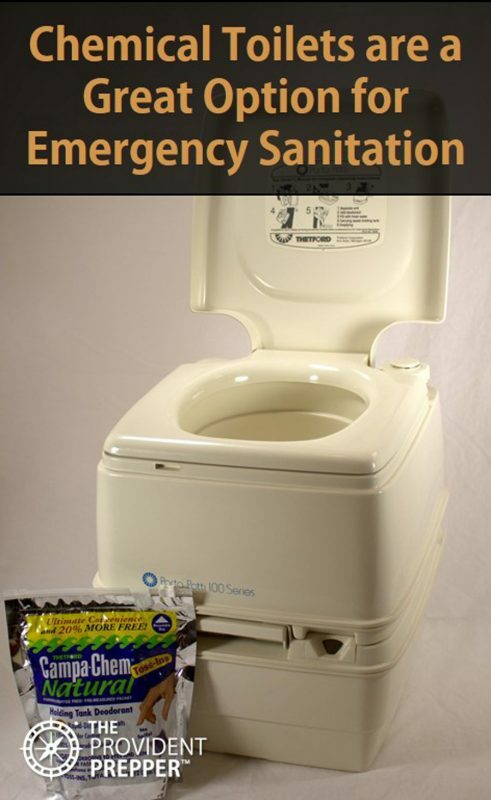 We share details on our post Preparing for Emergency Sanitation as well as in our video Emergency Sanitation Essentials: The Scoop on Poop (and Other Critical Topics). It may be difficult to sort through all of the products that are on the market to determine what is truly helpful and what is just “stuff”. We usually recommend incorporating the tools into your daily life. However, I am not about to use an alternative toilet everyday when I have a perfectly good flush toilet available. This is one time when you may just need to purchase a product, practice with it a few times to develop necessary knowledge and skills, and then put it on the shelf in the garage, hoping that you will never need to use it. Every situation is unique and will require personal adaptation. 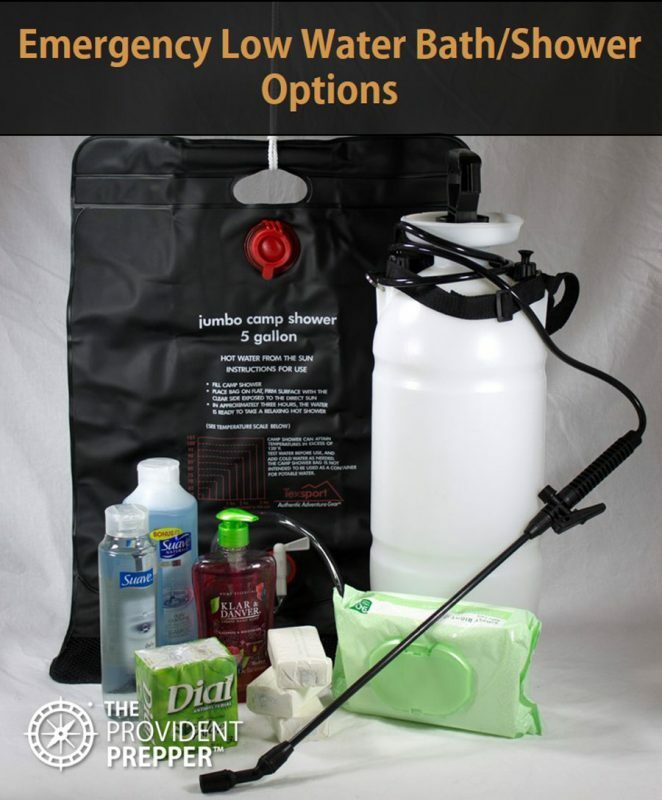 These are some of the products that we find quite valuable for emergency sanitation needs. Make a realistic plan and get to work so you will be prepared regardless of what life throws in your path. Hand washing is one of the most important things you can do to prevent the spread of disease. When there is little water available it can make it a bit challenging. 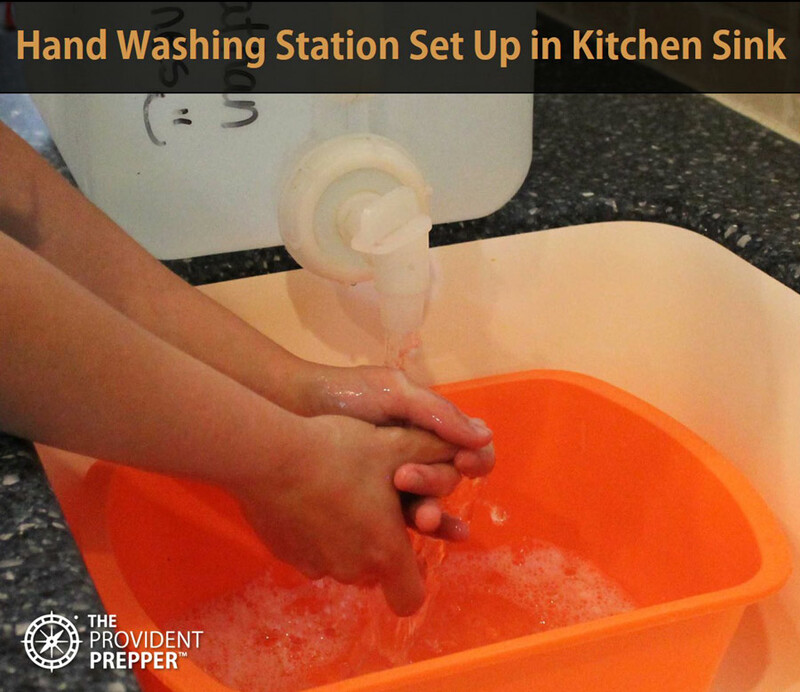 We make the most of the water we have by setting up a hand washing station in our kitchen sink. We create something similar when we are camping. Store water in a quality container with a spigot such as a Reliance Aqua-Tainer or a Coleman Jug with Water Carrier. Consider the number of locations you may want to place a hand washing station and then make sure that you have those stored full of water and ready to go. The water can be captured in just about any container for recycling to flush toilets or do laundry. The one in the photo is a disposable wash basin. Next, make sure to include liquid hand soap in your storage. I would avoid using bar soap in emergencies just to keep things a bit more sanitary. I am not a big fan of hand sanitizer, because I much prefer washing hands whenever possible. In low water situations, hand sanitizer can be quite valuable. Purchase larger bottles for use at home and travel sized bottles to place in survival kits. Nothing makes my day like a nice hot shower. Once when we were out of town presenting at a conference, the place we were staying had issues with the hot water. I had to take an ice cold shower. While invigorating, I did not wash my hair and was a bit frazzled all day because I had missed my morning hot shower. Life went on, classes were taught and small children did not die because I missed my shower. It was a good reminder to me of how important that shower is to me personally. The ability to take a nice, at least warm, shower when disaster strikes may help you remember why life is worth living. Gravity solar showers warm the water using the sun. The RISEPRO 5 Gallon Solar Shower Bag, ELECTRFIRE Solar Shower Camp Bag and the Advanced Elements 5 Gallon Summer Shower each vary in price and features. The less expensive models are not as durable as the pricier models. Pressure tank showers provide a stronger spray than the gravity showers. You may want to check out the OnTrackGear Outdoor Portable Camping Shower Kit (only 1.5 gallons/very short shower) or perhaps the NEMO Helio LX Portable Pressure Shower. One really nice hot shower option is the Zodi Outback Gear Hot Tap Travel Shower. The drawback of this emergency shower is that it requires a propane canister to heat the water and power to run a 6-volt water pump. It may be something to consider if you have back-up power. The goal is to get clean and, when possible, enjoy the experience. Check out the options and decide what fits into your lifestyle and budget. Be sure to practice to ensure your low water shower works the way you expect it to. Once you begin to explore your options for emergency toilets, you will be surprised just how many choices are available to you. Some are much nicer than others. This is one of those items that it is okay to purchase, practice using, and then tuck away in the garage hoping that you will never have to use it. Bucket toilets are not my favorite option. They can be unstable for anyone who is larger or smaller than average, such as young children. I sure would hate to tip over in a previously used bucket toilet! However, one thing that I really like about bucket toilets is that they are a great place to store sanitation supplies so you have everything in one place. Bucket toilets are portable, which is a huge advantage if you need to evacuate. I do not like the smell and accumulation of excrement in the bucket. This can be minimized with the use of bag liners such as Double Doodie Toilet Waste Bags, Cleanwaste Wag Bags Toilet Kit, and Go Anywhere Toilet Kit. These liners contain a bio-gel or Poo Powder that solidifies the contents and helps to reduce the odors. The permanent porta-potty that we create on our home toilet with regular trash bags can definitely be improved with the use of the waste bags above. Alternatively, purchase Reliance Products Bio-Gel Waste Gelation, Eco Gel Port-A-Potty and Emergency Toilet Chemicals or Cleanwaste Poo Powder to use in the bag to solidify waste and reduce odors. The nice thing about using biodegradable bags verses regular garbage bags in the portable toilet is that they can be easily buried and will break down without damaging the environment. Consider storing Green Elephant Portable Toilet Replacement Bags which are designed to be used with alternative toilets. A pocket sized Biffy Bag would be a nice addition to an emergency or survival kit. A Biffy Bag is designed to be used once and comes with toilet paper as well as a wipe in one nice little package. We have a couple of chemical toilets in our emergency supplies. We like the stability and the way the excrement magically disappears until we change it. A bedside commode typically used in the medical field makes a great emergency toilet. Depending on the model you purchase they are quite stable and will fold away nicely until needed. The little bucket can be used with commode liners designed to reduce odors and prevent spills. You may be able to pick up one at a garage sale or second hand store for next to nothing if you watch. Composting toilets are a longer term solution to a crisis without water and sewer. They are quite a bit more expensive, but will turn human excrement into a fertilizer that is safe to use on a flower garden. Composting toilets are Jonathan’s favorite solution for alternative emergency toilets. Our faithful garbage man arrives in front of our home every Thursday morning to take away the garbage that we have accumulated over the last week. Sometimes that garbage can is overflowing after only 7 days. What would happen if the garbage man failed to show up for 2 weeks? What about a month or more? Visit our post Prepping for Basic Emergency Sanitation for some good ideas about how to prepare for such an event. This article will focus on the items you should consider purchasing to ensure you are able to handle life if your trash begins to accumulate. Kitchen scraps which should be recycled in a compost pile away from the house. Cans should be flattened to reduce size in order to take up less space. Glass may possibly be washed and reused. Plastic should be flattened to reduce size and kept separate from burnables, or reused when approprite. Burnable items such as paper plates, cardboard boxes and paper can be used as a fuel source or fire starter. 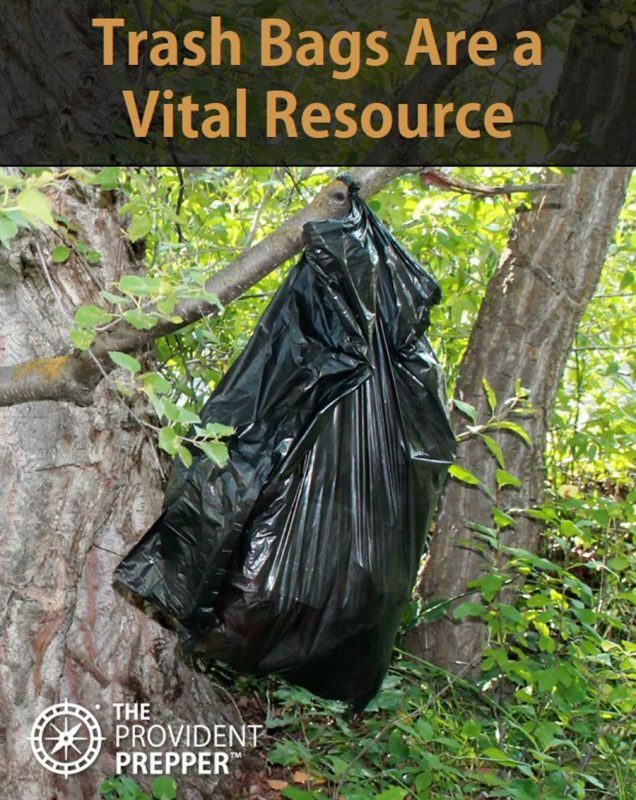 Quality trash bags are important for managing waste in an emergency. Buy a variety of sizes including; heavy duty contractor grade 42 gallon bags, heavy duty 30 gallon bags, and kitchen trash bags. Insect and rodent infestation can quickly become an issue. Make sure to include fly swatters, mouse traps, rodent bait (I prefer to use this in a bait station in order to keep kids and pets safe) and other items to control the population of pests. Laundry is a bit of a challenge everyday even with my working washing machine and dryer. What is the best way to wash and dry your clothes when the power is out and water is scarce? All it takes is a bit of soap, water and muscle. I much prefer the muscle to be provided by my well-loved washing machine than by hand, but sometimes you just have to do the best with what you have. None of the options we list below will adequately take the place of an electric washing machine. They will make it a little easier on your back and shoulder muscles. 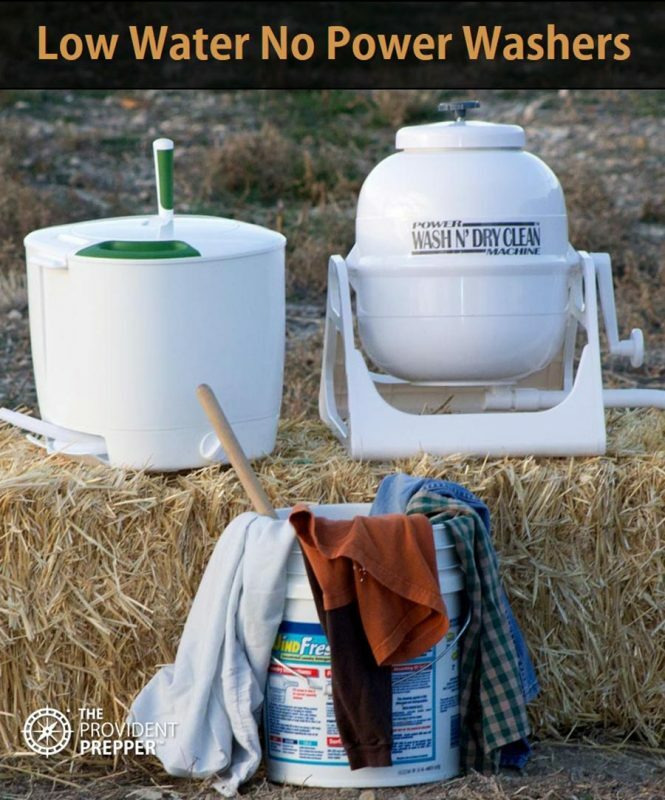 A popular emergency backup is the Breathing Mobile Washer Classic that can be used in a 5 gallon bucket to wash clothes. I like the spin-able Gamma seal lid used in the photo above to prevent the wash water from splashing out during use. Simply drill a hole slightly larger than the handle of the plunger washer in the lid and you are set. The Lavario Portable Clothes Washer is a portable non-electric manual washer that I am anxious to try. The Lavario has a 5 gallon capacity and is operated through an up and down plunging motion. It has a simple, durable design that would make washing clothes without power much less of a chore. Avalon Bay EcoSpin is a portable hand cranked manual clothes washer and spin dryer. The EcoSpin works like a giant salad spinner. I think it is quite effective at cleaning small loads of underclothing and other lightweight clothes. A pair of jeans is just too heavy to be cleaned well in this device. The spinning action is nice to force some of the water out of the clothes, requiring less drying time. The Laundry Alternative Wonderwash or Avalon Bay Ecowash are examples of a hand-crank, low water washing machine that you may want to consider for an emergency backup. The clothing is loaded at the top and then the tub is sealed. The entire tub spins by a handle located on the side of the device. These devices will help simplify laundry duties when the power is out and water is in short supply. However, as long as you have a container, water (warm is ideal), soap and a little bit of muscle you can clean your clothing. Drying clothes can be accomplished indoors or outdoors. You may want to invest in clothespins and clothesline so you can set up an expedient “solar clothes dryer” no matter where you are. A couple of good shovels may be one of the important tools you can have when disaster strikes. Imagine trying to dig a hole to bury trash or human waste without the use of a shovel. Tools are at the top of our “must have items.” We buy quality shovels, rakes and other gardening tools so they last a long time. Stock a couple of extra so you will never get stuck without one. If your ground is hard or rocky, you may also be thankful for a digging bar to break-up the ground so that shoveling is easier. It is critical that you can turn off your water at the source or meter if needed. Sometimes this can be done easily with a adjustable wrench. I prefer using a valve key as it allows me to turn the water off without reaching down inside the meter can, and is much easier. Most everyday plumbing crises, though frustrating, are manageable without professional help if we have a little bit of knowledge and a few tools. A plunger is a critical tool for everyday use, as well as for emergency needs. A clogged toilet is really no better than having no toilet at all. A drain snake is another important item to keep on hand. These tools typically have a reach of about 25 feet and are sometimes needed to clean a more difficult drain problem, generally inside the home. Depending on your particular situation, we also encourage you to have a pneumatic test plug or ball with necessary extension tubes so that you can prevent sewage back-flow from entering your home. If sewage system fails and raw sewage enters your home, you have essentially lost your home unless you can have it professionally cleaned, disinfected, and restored. A bike pump with gauge is required to inflate the test ball. It is important not to over inflate the ball so be sure to carefully read the instructions. Right now, when we have a problem, we usually have the option of having someone we trust come and fix that problem. In a crisis situation, that may not be possible. We encourage you to acquire some basic knowledge, skills, and tools so that you know what to do when you are on your own. We recommend that everyone to have a basic set of tools such as screwdrivers (slot and Phillips head as a minimum), hammer, pliers, fixed and adjustable wrenches, pipe wrench, tape measure, and utility knife. Make sure you have the personal protective equipment (PPE) needed to get the job done safely. As a minimum, these include gloves, safety glasses, and hearing protection. We hope these recommendations are helpful to you. We have spent hundreds of hours researching, experimenting and actually living the provident life. Hopefully, you will benefit from our experience. Knowledge is the most important thing you can possess. We are preparing to be self-reliant for as long as it takes until life can return to normal after a disaster strikes. It is important to accumulate both the knowledge and the tools you need to take care of the sanitation needs of your family. 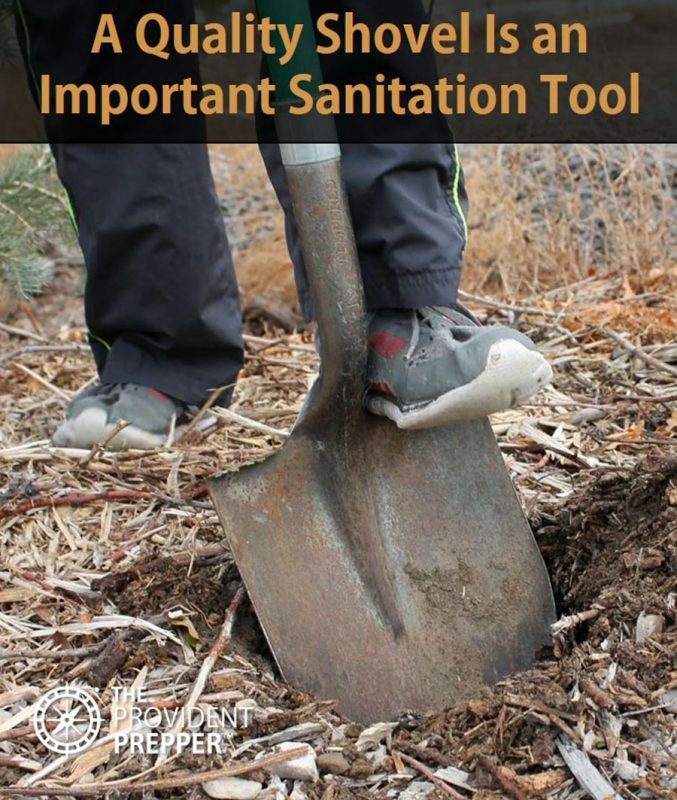 Click here for a free copy of a sanitation action plan to help get you started. You can do this!